The three wise men in the dinghy racing world are Ian Proctor, Jack Holt and Peter Milne. Between them, they have virtually captured the market and I have already sampled wares offered in Proctor’s Typhoon and Holt’s Jacksnipe. It is fitting therefore that the third vessel to be tried was Milne’s Javelin. The designer is of course justly famous for his fireball inspiration, can he pull off a double with the latest Javelin? Philip Smith of Southern Service Boat Centre believes that the answer is yes and is distributing the boat in the Southern Area for £325 plus sails. The opportunity to test the boat came on a blustery Sunday. The day that the rains came down, might be an appropriate tune. The Weirwood Reservoir was alive with white caps as the sleek 17ft 7inch racing craft was lifted into the water by an all too willing band of helpers. Eddie Mays a veteran crew of two previous tests, cheerfully pushed off and we settled down for a force five thrash to windward. What a relief to be sailing a single-bottomed boat with plenty of room to bounce about in and a far greater sense of security. A few quick tacks and it became clear that the Javelin is an easy performance boat to handle, the main sheet controls are in the correct position and the rig is well balanced. Lively tacking came naturally and the first impression was of 505 and Dutchman performance but without the remoteness associated with these craft. The next thought was the anxious one of how the boat would handle downwind. We could carry on “up the Kyber” forever; the moment of truth spelt out in planery language was near. Up with the plate, out with the jib and main and a cloud of spray chorused to the extra speed. Nothing to it, a real joy. Eddie grinned as always and the camera crews of the two rescue boats clicked happily. Perhaps the bird would fly fast enough on a dead run to take the bite out of the wind and enable the spinnaker to be set. Eddie shook his head, the photographers nodded theirs. I dithered for a while and tried a few dead runs. It all felt great so we finally set the third sail and roared down the reservoir. Nearing the clubhouse we discreetly began to lower the spinnaker. Half way down in the best traditions of the Gerald Hoffnung saga the spinnaker halyard jammed. What a way to go I thought, right through the reservoir wall on a full plane with the gay cry “no brakes on this thing.” Fortunately a violent tug brought the spinnaker clew just within range, and it was quickly uncleated. Saved by Eddie. Back on shore, the boat was looked at in more detail. Built-in buoyancy in the side tanks and that glorious freedom of movement with the single-bottomed floor were obvious merits for long-legged crews. Reasonable spinnaker stowage and a very well thought out arrangement for fairleads and cleats. Twin stainless steel tracks house both the nylon fairleads and jib jambers and this simple scheme gives easy adjustment for any possible requirement. A 1 inch diameter spinnaker pole is fitted as standard but although this was satisfactory on a dead run, a larger one would be necessary for heavy weather reaching. The rudder blade seems to be on the small size but gave perfect control on the reservoir. It could be that in a heavy sea increased depth with more area low down would be advisable. Unfortunately all of the "Three wise men" are no longer with us. Ian Proctor (1918-1992) designed such classics as the Tempest, Topper, Wayfarer and the Osprey. Jack Holt (1912-1995) was responsible, amongst many others, for the Enterprise, GP14, Solo and Hornet. 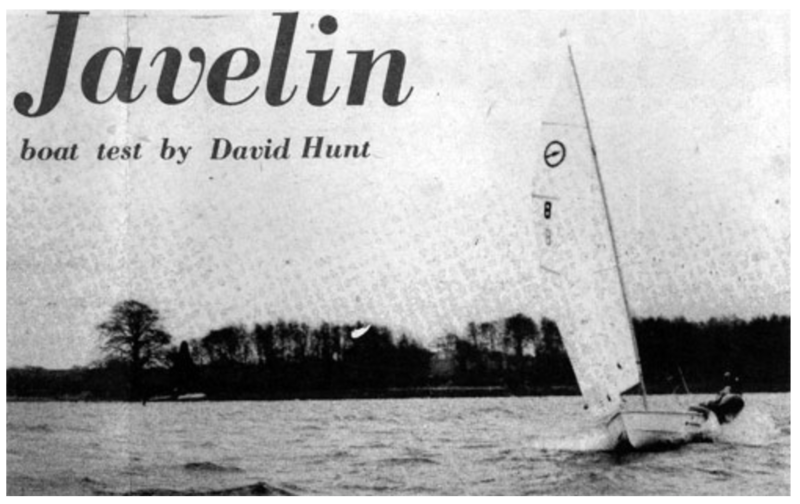 Peter Milne (1934-2010) the father of the Javelin and one of Britains best known designers and sailing journalists. He was actually the editor of Yachts & Yacting at the time of this test, which was handy ! Javelin No8 was the third fully grp boat built. The referance to single bottomed boat is due to the fasion at the time to have a raised floor or double bottom. Sheeting positions for the Genoa were outboard back in 69 and the shrouds were 6" inboard. 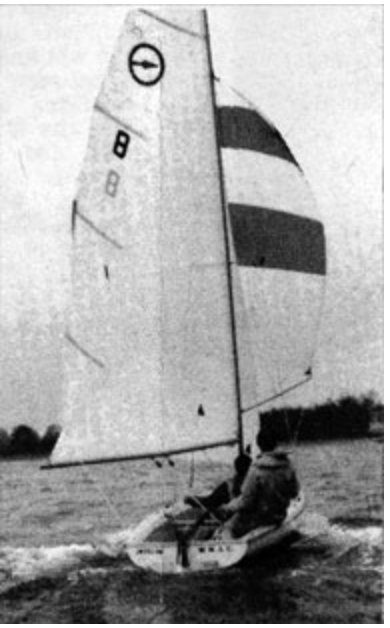 The spinnaker chute as we know it had not been invented so the shute box in front of the mast was an innovation at the time and a step towards the chute which arrived about four years later. They were right about the spinny pole - 1" alloy is a bit light weight! The rudder blade also has been increased to the point where it is no longer controlled in the rules. Inflation price would be £3,900 today. Inflation price would be £900 today.